Some people love ripping boxes. Others prefer to build sets by going the old-fashioned route of a handful of packs here and a couple there. Some just like to buy the set and be done with it. 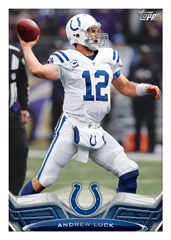 Enter the 2013 Topps Football Complete Set Hobby Edition. It offers a full set of 2013 Topps Football and few frills. The 2013 Topps Football Complete Set Hobby Edition comes with all 440 base cards found in the flagship set. It's one of the most comprehensive checklists of the year, delivering all of the NFL's biggest stars and tons of rookies. The factory set also comes with five Orange parallels not available anywhere else. With all 440 cards getting the orange-border treatment, these cards could prove popular with player collectors. A lot of factory sets remain sealed or make their way into the hands of casual collectors who are less likely to sell or trade the bonus cards. 2013 Topps Prime COPPER RAINBOW AUTO Andrew Luck #1! #'d 10!! Colts!! 2013 TOPPS FOOTBALL COMPLETE FACTORY SEALED SET! !